We often hear concern about the cost of field use permits, so let’s price them out. In Prospect Park, field use for sports like soccer, football, frisbee, etc. runs $16/hour without lights, and $25/hour with lights. If you play with 20 players (10 on a side) that works out to 80 cents per person without lights, and $1.25 per person with lights, which sounds like a real bargain. By comparison, a full season tennis permit costs $200. A single play tennis reservation costs $15, and you can only split that cost among a maximum of four people on a court. 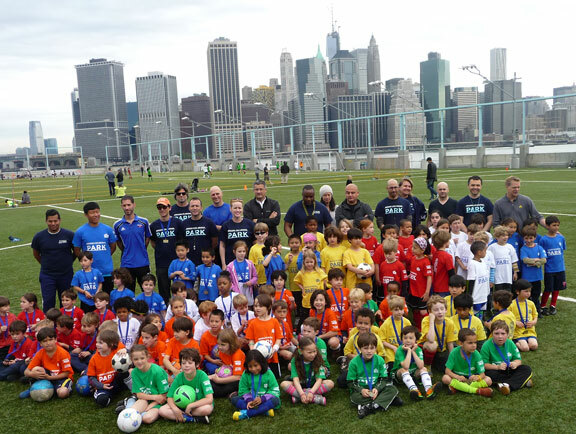 The inaugural season of Brooklyn Bridge Park’s youth soccer league. Brooklyn Bridge Park recently began a youth soccer league that costs a mere $25 per player for a 10 game season, and that covers use of a gorgeous new turf field, a coach, one weekly practice, and a team T-shirt! If cost is an issue for players, many local businesses and organizations in this community-minded neighborhood of ours would be thrilled to sponsor local sports teams, especially in youth programs. Sponsors will happily cover the cost of permits, and can even supply uniforms and refreshments to boot. If you have a team seeking sponsorship, or if you are a local business seeking sponsorship opportunities, please email turftheslab@gmail.com or feel free to leave your information in the comments.